Looking for a light and delicious summer dinner? These Salmon-Coconut Patties from 30-Days Grain Free are a refreshing new take on your typical fish cake. And trust us, once you try this Green Pea Salad you’ll be making it all summer! Salmon patties fried in ghee or coconut oil make a delicious whole-food alternative to fish sticks, which are coated in gut irritating white flour and fried in questionable oil. These hold together with shredded coconut and a little egg rather than the typical bread crumbs. The accompanying salad made with green peas is a child-friendly side dish dressed up enough for adults to enjoy. To make the salmon patties: In a large skillet set over medium-high heat, melt the fat. In a medium bowl, mix together the salmon, eggs, and coconut with a fork. With clean hands, form the mixture into 12 patties. Add the patties to the melted fat (working in batches, if necessary) and fry them for 5 minutes. Flip and cook for about 3 minutes more, or until browned on the other side and cooked through. Squeeze some lemon juice over the patties before serving. To make the pea salad: In a large bowl, gently mix together the peas, onion (if using), radishes, mayonnaise, cider vinegar, mint, and sea salt until the peas are coated with the mayonnaise. Keep any leftovers covered in the refrigerator. We are making extra salmon patties here and we’ll have these in lettuce wraps for lunch tomorrow. Serve some fresh fruit for dessert if you like. Making mayonnaise at home is very simple and takes less than 5 minutes! When we make mayonnaise ourselves, we control exactly which ingredients are used. We can choose healthy oils that are health promoting, and avoid the cheaper, unhealthy canola or soy oils used in store-bought brands. Into a food processor or blender, crack the eggs. Pulse to blend. With the processor running, take 1 full minute to pour in each cup (236 ml) of oil slowly. Watching a clock with a second hand can help. By the time 2 minutes are up (or 1 if you’re making only half a batch), it should be thick and emulsified. Add the sea salt to the mixture while the processor or blender is still running, and let it mix in. Transfer to a pint-size (455 g) Mason jar, seal, and refrigerate. Use within 1 week. 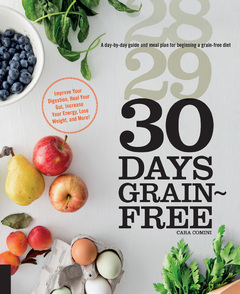 If you’re keen on giving a grain-free diet a try – be it for your health, or due to a doctor’s suggestion, or for your child – 30 Days Grain-Free is a resource you can’t be without. Covering meals for breakfast, lunch, and dinner for 30 days straight (and then some), you’ll learn how to approach this revolutionary diet simply, healthfully, and deliciously. No wondering what you’ll have for dinner, or how you’ll survive weekend brunch. Instead you’ll take it one meal, day, and a week at a time, without any guesswork – or huge time commitment – involved. Having a plan may be the most important key for succeeding on a grain-free diet, and with 30 Days Grain-Free, you’ll have everything you need for success right at your fingertips.